This tree diagram has been completely mixed up! It's up to your little naturalist to unscramble each word and fill in the blanks. As he goes, see if he can define each part of the tree, including the ones in the word bank that are not used in the diagram. This word scramble is full of color words that need to be re-arranged and spelled correctly. 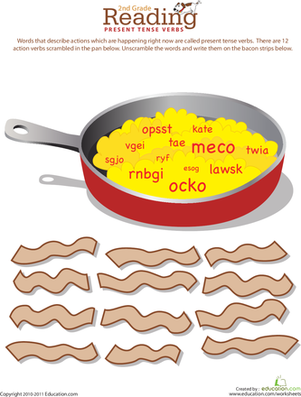 A word scramble that is, and it'll give your young chef's memory a spelling and vocabulary boost. This animal word scramble is great spelling practice, too! Give your kid this word scramble the next time she takes a plane trip to challenge her mind and pass the time! Cook up a lesson in present tense verbs with this fun 2nd grade word scramble worksheet. This aw and au word scramble helps kids to practice their understanding of this common vowel digraph.